Without the big climb up past Yarrumundi and on to Mt Victoria, day one was a lot easier than everyone expected. So apart from the handful of riders who kicked on into the wee hours drinking beers, singing (terribly, I must add – I could hear them from my room upstairs in the pub) with the live band in the bar and shamelessly flirting with a Channel 9 reporter in town to cover the bush fire crisis, we all awoke feeling a lot better than anticipated. The fires, whilst still burning, had behaved overnight and the Great Western Highway was still open. Phew. Despite the apocalyptic weather, it was a typically brisk morning and, of course, there was still a lot of smoke blanketing the town. One wag summed it up pretty well when at breakfast he declared: “I feel like a smoked ham.” Indeed, we all did. Our tireless organising team, led by a truly remarkable human being, Mr Andrew McKay, had been once again forced to change the 2013 route. Instead of riding out via the Darling Causeway, road and train line closures forced us into crappy circa 1980s buses for a commute down into Lithgow at 6am. We felt a little sorry for drivers. No doubt expecting a quiet trip down the mountain with one or two passengers from the first train of the day from Sydney, they were instead confronted by 80 rowdy cyclists wanting to jam both themselves and their bikes on to their buses. I volunteered to help pack the bikes, an interesting experience. Imagine playing Tetris with $4000+ pieces, each with plenty of bits that can be scratched and bent, and a nervous owner ready to abuse you should you make even the slightest of errors. Talk about pressure. Fortunately, the only damage was to a helmet attached to one of the bikes…and that happened as the bikes were being unloaded in Lithgow, someone’s else’s watch. Despite the highway being open to traffic and under no immediate fire threat, the 27km bus trip into a freezing-cold Lithgow (3 degrees!) confirmed just how right the organisers were not to let us ride it. Mother Nature had decided to play her next card against the 2013 Zoo2Zoo ride; the lower the bus descended down from the mountains, the more we realised the cloud of bush fire smoke was metamorphosing into something that smelled very different, but looked very similar – a pea soup fog. With visibility at about 5 metres, we weren’t going anywhere for a while. Our next stop, Bathurst, would have to wait. Being cyclists we did the only thing we could do: have coffee. Not dissimilar to the bus drivers whom we overwhelmed earlier, we descended upon the only cafe that was open on Lithgow’s main street and created a mighty Lycra conga line to the front counter – just the latest in a very long line of, well, very long lines. 40 minutes later or so my coffee arrived in my hands, where it stayed for several minutes to help warm them up. After a 60-minute delay the fog had lifted enough for us to begin the day’s riding. Instead of the original 181km, it would now see us travel ‘only’ 150km. Still a decent hit-out, of course, but a tad disappointing for me as this would have been my longest ever one-day ride. Oh well, there’s always next year. Before we’d even left the Lithgow town centre our group leader, Tim, was dive bombed by a magpie. Twice. Was this yet another omen? Perhaps. But as we finally got rolling, it must have been a good one. Because that first stretch, 60km from Lithgow to Bathurst, was one of the most enjoyable group rides I’ve ever done. Some long but steady climbs that really allowed you to find a good rhythm. Several high-speed downhill sections. All under clear and largely smoke-free skies. The only dampener was the road claimed its first Zoo2Zoo skin when a rider in another group slammed into a pile of road kill and crashed. His Garmin was mangled when hit by passing traffic, but thankfully he wasn’t too badly injured, although he did require first aid and spent the rest of the day watching from a support car, no doubt stewing over the fact no one called out the festering fly-blown carcass he was about to smash into at 35 km/h. This was one of the main learnings for me. When you ride/race with the same people most if the time you develop a strong and innate understanding of each other’s riding styles and calls which makes things so much safer. When thrust into groups of riders who’ve never rolled together on roads they’ve never ridden, it can get more than a little sketchy. Sadly, this appears to be what brought Richard down. The westward run into Bathurst was fast and a whole lot of fun. With testosterone and adrenalin surging I couldn’t help myself. Like a greyhound chasing a bunny at Wentworth Park I took off in pursuit of a passing group on a fast downhill section, abandoning my group with about 10km until lunch as I shifted into the big gears and pumped out – for me – some pretty big numbers, hitting upwards of 1100w. I felt bad about this later, but I cannot lie: I wanted to hammer it into the home of Aussie motor sport. And I did. As we tucked into a well-earned roadside brunch at the Bathurst Visitor Centre, spirits had lifted just like the earlier fog. Plenty of chatter. Plenty of laughing. Plenty of smiles. With Sydney far behind us now, it was really beginning to feel like a charity ride. Now we’d had a proper hit-out and the varying rider abilities has been laid bare for all to see, the groups were shuffled about a little in the hope of striking a better balance. We lost several riders from our bunch and gained a few others in their place. We first eyeballed our new riding buddies in the car park about 30 seconds before roll out. As it turned out they were a great addition, prepared to share the work on the front and good communicators. Having spent most of the morning on the front with my nose in the breeze, I for one was very happy to see them! After Bathurst it was onward to Orange, a tough section of road that really zapped the legs. We found out later at dinner that a few guys had decided to take a loop of the Mt Panorama race circuit, but my group never even discussed it at the time. Oh well. Thanks to a great local publican and long-time supporter of Zoo2Zoo, Orange saw us enjoy lunch and drinks on-the-house – all 140 of us. Even better, they had air con and comfy stools to sit on, offering much-needed respite for our sore backsides. The final section of a Day 2 was the ride into Molong, our stop for the night. This stretch reminded me a lot of the last 30km or so of Blayney to Bathurst, where the final 10km was fast – paceline fast – as like super magnets we were drawn with considerable force towards our finally resting point. The run into Molong also saw me experience my finest hour of the 2013 ride. I’d been having trouble with a slow leak on my rear tyre all day. Too lazy to change it, I’d intended to sort it out in Molong and felt pretty sure I’d get there without any trouble. Wrong. With about 18km to go I felt the rear go pancake flat. I asked the guy beside me for confirmation, and he didn’t need to speak: the look on his face said it all. Bugger. Given the slow nature of the leak I told everyone not to stop for me; they had good pace and I didn’t want to ruin things for everyone else. I figured a 30-second CO2 stop and I’d be away again. Four minutes later I was ready to hurl my (broken) CO2 valve into the nearest field. Thankfully my guardian angels, Bec and Megan, rolled up in our support car – with a pump. 30 seconds later I was on my way. Pissed off and a little embarrassed I decided to try and chase back on. The first few undulating kms were solo, just me and the support car behind. (I considered asking the guys to pace me back on, but they were new to cycling and I wasn’t sure it was a wise idea for them or me!). Then I spotted another bunch up ahead. Another conscerted effort and I was on the back. As I sucked in the big ones, my sprits were lifted again as I saw my bunch in the distance. I doubted I could bridge on my own so I sat in, waiting for a quicker group to pass. In this way I was very lucky, as this was the only stage of the entire ride where the fastest groups started last, not dissimilar to a handicap. Within a few kms the ‘scratchies’ duly loomed behind us and as they hurtled by I jumped aboard. Before long I lobbed back in with my somewhat surprised bunch, feeling very pro indeed. I’ll remember that 15km or so for a long time. We rolled into Molong as one, and were greeted at the local rugby club with cold beers, fresh sandwiches and delicious local fruits. Lots of the community had come out to say hello and the mayor even came along to welcome us to town. It was a great feeling; a wonderful end to a great day’s riding. A hot shower awaited back at the hotel, but first I jettisoned my mischievous inner tube. As things turned out, the valve was the culprit – thankfully the tyre itself was fine. The only downside of fixing my rear wheel was by the time I did make it back to my hotel room, I’d missed out on a bed. First in best dressed. It was to be a night on the floor for me. At least the carpet was clean. The official Zoo2Zoo dinner took place at the Molong RSL, an annual tradition involving presentations from both the Black Dog Institute and the ride organisers. 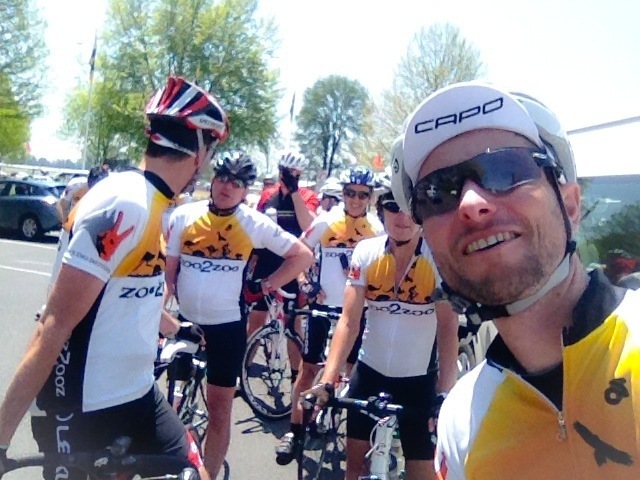 Turns out we’ve raised over $180,000 from this year’s ride – not bad for just 100 riders. The dinner came to a close with another Zoo2Zoo tradition, a tongue-in-cheek kangaroo court where riders are ‘fined’ for pretty much everything from crashing into road kill to using your small chain ring on a climb. Hundreds of additional dollars were raised. Good stuff. Tomorrow is a shorter day, about 120km, but with legs getting fatigued now – and quite a few beers tonight – it should still be interesting….. 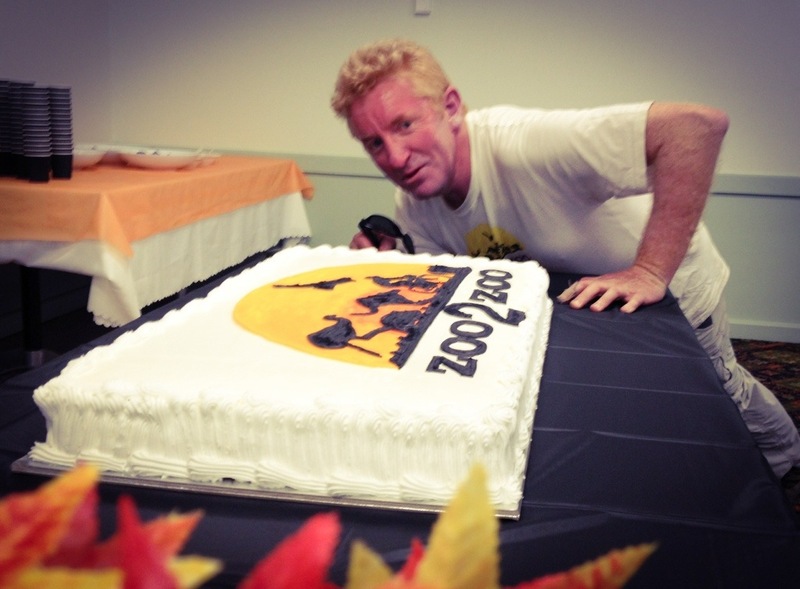 The amazing Andrew McKay, Z2Z founder and head organiser, with an equally amazing cake (at Molong RSL).